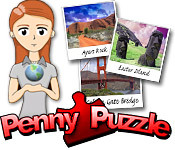 Travel the world with Penny Puzzle as she takes photographs of famous and renowned landmarks and locations! Travel the world with Penny Puzzle as she takes photographs of famous and renowned landmarks and locations. Journey from Egypt, to the Forbidden City, to Paris, and beyond. Impress your boss, Mr. Mumbles, and climb the corporate ladder as you embark on an adventure, capturing images and piecing together uniquely crafted 3D puzzles. 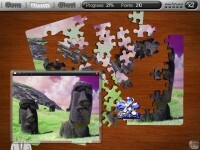 More than 45 puzzles to play. Help Penny move up in the world. Tell someone about Penny Puzzle Game!